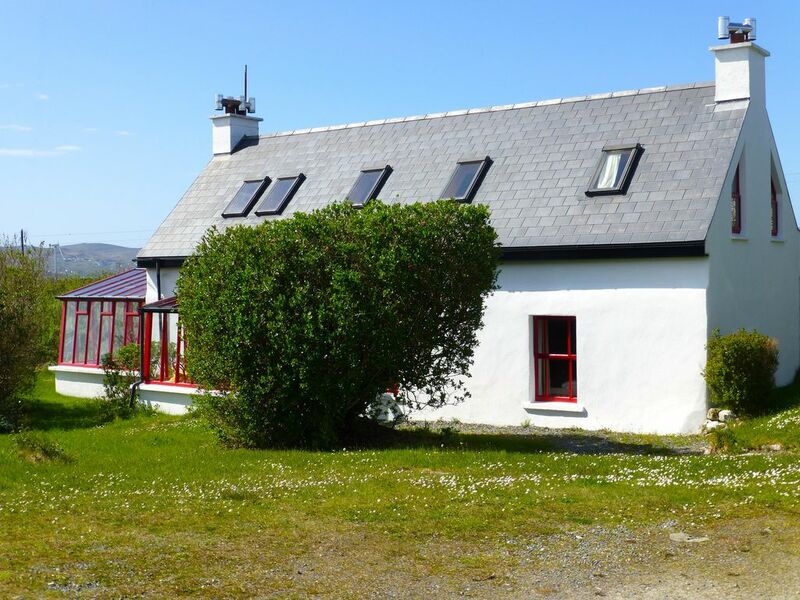 It is a beautiful old granite Irish cottage, located on our own large sloping southern property facing the Atlantic with dream view of the sea and islands. In a quiet area, the cottage is situated near a fisherman's village for music, dining and shopping. There is a large apartment for six persons on the ground floor: living room with fireplace, a large kitchen/dining room, three bedrooms, hallway, bathroom and two winter gardens (one large one small) and at the first floor there is a studio for another two persons also with a living room/ kitchen and fireplace, one bedroom for two, hallway and bathroom. You can get to the studio by staircases from inside and outside. Further Details: Gaeltacht region (care for Irish culture, language and traditional music). The world of West Donegal, a breathtaking land of great mountains, lake –filled valleys, edged by a rugged coastline neclaced by beautiful sandy beaches and washed daily by the clear unpolluted wild but beautiful North Atlantic. With safe , quit, sandy beaches it is a tranquil land, rich in the heritage of ist Irish language, an everyday language spoken by the people of Gweedore and the Rosses. At Lackennagh, Burtonport, you are right in the centre of the Rosses. People are very nice, but the house is "rustic"
The owners, Heidi and Werner Siebel, are very nice and talkative - in the summers they live in a cottage on Inishfree, and sometimes in one of the trio of cottages that this property is a part of. The caretaker, Frank, is also very nice, and he will try to help you however he can, but in some cases there is not much he can do. We referred to staying here as "camping indoors". Things do not always work, and you must be willing to accept the intrusion of the outdoors. 1) There is a small, glassed-in entryway, and a larger glassed-in sunroom. These both attract a lot of flies. As there are no screens on the windows, and doors must be opened to get in and out of the house, you will end up with a fair number of flies in the house. At night, you will also find many small centipedes crawling up the interior walls (there are many more on the exterior walls), and these will also find their way into the floor of the showers. They are harmless, but they are there. 2) Practically speaking there is no internet service here, though it is advertised as having internet. The signal apparently comes from a tower on the island of Arranmore, off the coast, and is picked up by an antenna in another of the cottages here, with a relay to the third cottage - this cottage has no antenna. This one signal is shared among the three cottages, and if someone in another cottage is using the bandwidth (all of 6mb downstream, and 2mb upstream, according to the internet provider representative), they will have the access and you will not. Twice, after midnight, I was able to get service, and once in the afternoon, for maybe an hour - that was it for the week. 3) There is an upper apartment with one bedroom (two beds), a bathroom, and a large living room, where the only TV is (a small old tube model), but there are two ways to access it - by a very steep interior home-made stair/ladder, with a half step for each rung (so you cannot put both feet on a rung), which means you cannot carry anything large or heavy up with you or you risk serious injury, and an exterior regular stairway, which you will have to use to bring in anything larger than a glass, but means you may get wet, because it rains nearly every day. 4) The heater on the second floor provides hot water for about one minute, so I got a cold surprise when I tried to take a shower. 5) There is only one key for the house and no key for the upstairs door. completed as we just returned home from Ireland. I will confirm the refund. We will be back again in the fall and perhaps try to stay again. We had a wonderful time. Everything we needed was at the cottage and it was spotlessly clean. Frank gave us all the information about what to do and where to go and was so helpful. We were there 5 days and wish it could have been longer. The scenery both from the cottage and all around was fantastic. This is Donegal - windy, rainy, cold, but also sunny and warm. Turf and heather soil, flowers, sheep, birds. "Wild" Atlantic with magnificent cliffs next to quiet sand beaches. This cottage overlooks the coast and some offshore islands and is completely quiet and sheltered off sight without being isolated and lonely. We were told it is 400 years old but it has been renovated with love and care and now holds four double bedrooms, a spacious kitchen and sitting room, a bathroom and a conservatory. Upstairs there is another bathroom and a lovely studio with a kitchenette. Equipment for kitchen as well as for bedding is ample and of reasonable quality. The fireplace was just a bit smoky at first but then did its duty well, firing material (turf briquettes) was provided in good quantity. There are electric heaters as well. Hot water comes from an electric boiler and was never a problem. We shared the cottage with seven and it did not feel crowded. Everything was clean and well maintained. There is a wifi connection, but it was rather slow. There is a television set which we did not try; no DVD. Both the owners and the local housekeeper are friendly and very ready to help, and we liked chatting with them, they could give us valuable informations about the area. We felt that they really cared about our well-being. There are a shopping facility (petrol station with local shop) as well as a pub doing very good seafood within walking distance. Dungloe, about 6 km, has several supermarkets (Aldi, Lidl) and also several pubs where one can recommend to eat and a number of takeaways which we did not try. Attractions and activities in every direction: To the North, cliffs and beaches around Horn Head and Bloody Foreland, and we can recommend Leo's Tavern in Crolly, just off the N56 to Gweedore, as a fine specimen of a typical Irish pub with live music, good food and a bar with Gaelic speaking regulars. To the East, Glenveigh National Park and Glebe House, home of English painter Derek Hill with a remarkable collection of paintings, Japanese woodcarvings and other articles of art. To the South, the cliffs of Sleave League which aren't any less breathtaking if one knows that they are not, as often told, the highest in Europe. And to the West, Aranmore Island (ferry from Burtonport) with a beautiful 15 km round path. We would recommend this cottage to whoever likes to get away from busy town and tourism and likes Ireland at its best. And we would love to come back. Another brilliant stay in this great cottage. So clean, cosy and a great location. My friends first time in Donegal and they just loved it. Frank and the cleaning staff keep the cottage really nice. The beds are also really comfortable. Be great if there was an iron and ironing board in the cottage and water pressure in shower is low but didn't spoil our stay. The house is located on a large piece of land in one of the loveliest Donegal landscapes in Northwest Ireland. Steep coasts, sandy beaches, nature and authentic Irish culture. Other Activities: Excursions to the islands and to the national park. Sea fishing.